Last year in the England and Wales alone there were nearly 11 million eye tests and no doubt many of these individuals required their vision to be corrected using glasses or contact lenses. Glasses can be bought for less than a hundred pounds, but the average pair costs a little over this and you could find yourself paying several hundred pounds for nice frames and extra thin lenses if you really want to go to town. Don't you wish that your vision was perfect now? These prices might seem quite reasonable, but if you need to buy a new specs every two or three years how much is this going to cost you over a lifetime? It isn't all bad news though because it is possible to have your eyesight corrected on the national health and glasses can be obtained at low cost or even free. Also, depending on your occupation it may be possible to claim back the cost of the eye test and some of the cost of spectacles. A good example of this is if you use a computer for long periods of time. Most good employers take the health of their employees very seriously and will usually encourage you to have your eyes tested regularly if you work with display screens. 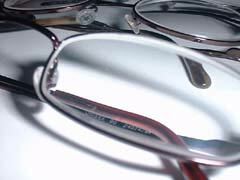 The downside of national health glasses is that the frames are usually very plain and special thin lenses for those of use with poor eyesight are usually not an option. I remember wearing these Clarke Kent type glasses when I was younger with bottle top lenses and thick black frames. I personally don't think they were all that appealing but I hear that that look is back in now. NHS spectacles are much better these days, and if you're on a budget then you should be able to find something that suits you in the looks department and more importantly properly corrects your vision. Are you then telling us that you cannot monitor your own website?, can you not block these people posting adverts? I get a few of these comments (see below), mostly with people trying to advertise their website. Maybe Google doesn't work these days since FB took over the world! One thing that bugs me though. This site IS NOT A BLOG! Its a nice blog. Has anyone ever tried https://www.perfectglasses.co.uk/? I have heard a lot about Perfect Glasses. Perfect Glasses is an online eyewear store. Their prescription glasses range starts just from £9. They have a good customer reviews as well. I think, I should try Perfect Glasses. Hope to get a good deal and value for my money. Tim, how do you get your eyes tested over the internet? If everyone bought their glasses online and all the opticians were thus forced to close, where would you get your eyes tested then? Has anyone used vision2you.co.uk recently? Good or bad reviews? I'm reluctant to hand over my money without knowing they are genuine. The cheapest prescription glasses you can get are from SelectSpecs.com. It sounds too good to be true but honestly, they really do cost only £6 plus £3.50 postage. I got a pair recently as my glasses were old and badly scratched but I'd been putting up with them because a new pair from my optician was going to cost loads. I wear contact lenses most of the time so I didn't want to pay a fortune for glasses I don't wear that much so I was thrilled to pay a just a few pounds. The lenses come with all the coatings too, no extra charges for those. The cheap ones go up to -6 but if your prescription is above that or you want advanced or thinner lenses or nicer frames they do loads more that still cost very little compared to all those high street opticians, even the ones who claim to be bargain basement. No need to fly to Taiwan, just go online! I recently had my eyes tested but could not find frames I liked at the same optician. I have found a variafocal lense that I can get on with but on visiting 4 different "glasses shops" found that the exact same lense varied from £213 - £218!!! Surely this should not be allowed on something so important. I can cope with shopping around for my washing machine but my specs - I dont think so!! I had an eyetest the other day. my prescription is -12, I am severely myopic, and new glasses would cost £450 or more. I can't affford this, if I don't have the lenses thinned then even my own family can't bear to look at me (the experience I had of this at age 14 taught me I was a social leper with these obscenely telescopic lenses that nearly reach the moon. even with an HC2 certificate (I have M.E.) only 70 quid can be shaved off. my prescription has altered, I need new glasses badly, yet no way can I stretch to these prices. it's so unfair. specs are tax deductable if used for only specific jobs and nothing else, iobvious example would be a builder using safety specs, though someone who only requires specs for intermediate vision and uses a computer all day should be able to claim against expenses. Your sight test can certainly be put against expenses if you are a vdu user most of the day. If you are employed and require a prescription for vdu use only your employer has to contribute. Remember though that VAT on spectacles is very low 0 on a sight test and betweeen 4 - 6 % on spectacles hope this helps. I can certainly vouch for Alan of Dennies Spectacle Makers. He does a brilliant job and if you have any problems with your glasses he gives excellent customer care after you have purchased them. I have known Alan for 2 years and have just contacted to order a pair of galsses from him. My former husband had a pair of varifocals for under £100 and a second pair just for driving, not varifocals, for £15Alan's prices may have changed since these prices were paid a year ago. I recommend him to everyone I know who needs glasses. Get on a plane to Taiwan. You can get beautiful pairs of glasses for 20 pounds each. Fancy a spot of acupuncture? 10 pounds per session. Lunch for 90p (pork chop, rice, 3 veg and soup) then take a stroll to the dentist's and have your teeth cleaned and polished for 15 pounds and get a filling and a crown done for just over a hundred pounds. It's worth the airfare and you get a good holiday too. why not buy eyeglasses online?